Cosplay on Flickr - wtf? So, I post a couple of pics on Flickr of myself dressed as a character from a computer game and I get a warning ' Staff have decided this should be hidden from public searches'. I already have the 'Safety Level' set to 'Restricted', there's no sign of 'the last turkey in the shop', my account has been reviewed and found 'safe'. What's their problem? 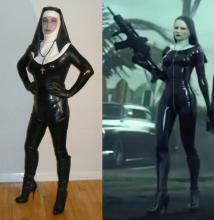 The offending picture (left), me dressed as 'Boo' from 'Hitman: Absolution'. On the right, the original character 'Boo': I posted this pic 'no problem' despite her toting a humungous gun (and the images is also technically copyright, I expect, mea culpa). As I'm posting here, my other pics are getting the same treatment, everything is now unsearchable. grrr! (27 Oct 2012, 23:53 )culmor Wrote: my account has been reviewed and found 'safe'. The bottom line - do not use free services. I had the same problem with photobucket, facebook and as you can see quite a few of images hotlinked from some free pics hosting services (media*, etc) have disappeared. And this is why I prefer to upload to this site instead of link to the source despite all these copyright claims. Photobucket, for example, never publishes naked women, even if it's a classic art. Current time: 19 Apr 2019, 06:52 Powered By MyBB, © 2002-2019 MyBB Group.